Customer in Florida writes "my garden was on the side of my house out of sight, and I didn't have a water hose near where I put the garden. So inevitably I would forget and garden would dry up. I'm a new Gardner so things like that get away from me quick. The idea here was to capture the water using the (RainSaucer) so I would always have a supply over there and furthermore to put it on a timer. I do not have gutters on my home so this was the best way to get water in the barrels for me. 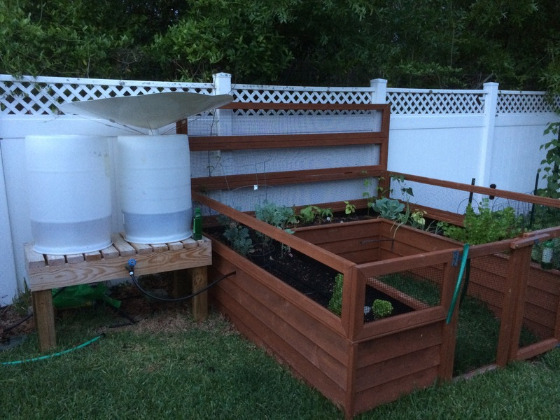 It is a drip irrigation system I built to water the garden....It is working like a charm, doing what I had hoped for." 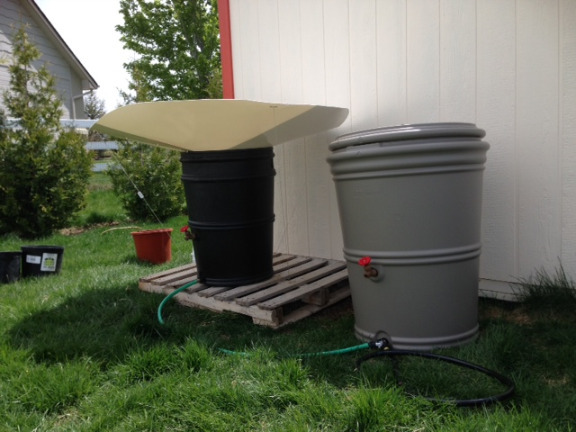 Customer in Washington State uses a 59" RainSaucer with our DIY Rain Barrel Kit including spigot and tie downs. She says it "works like a charm. 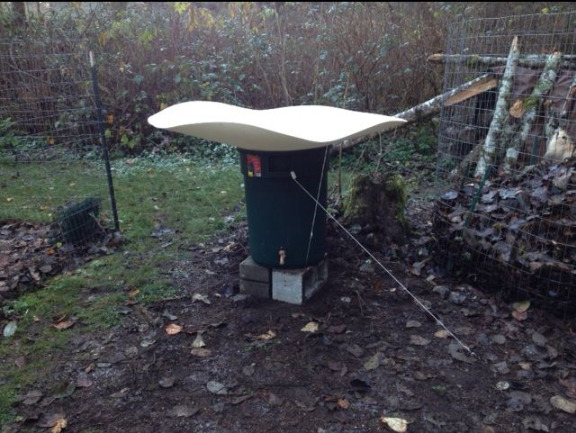 I have put it right by my garden/compost." Customer in Idaho writes "it survived snow, ice and windy weather!..i have a little farm in our property and use the water mainly for gardening and water for my chickens. I just added a second rain barrel (65 gallon) today since my 45 gallon always ends up overflowing! No regrets at all with my RainSaucer! highly recommended!" Customer in Illinois. Husband gifted the unit to his wife. They use it with a 15 gallon barrel for emergency drinking water purposes. Wife says " the rain saucer is a really great invention, not to mention a good conversation starter:-)!!" 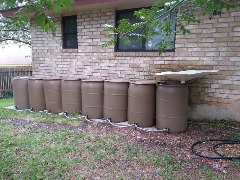 Recently we heard from a customer in San Antonio, TX that did not have gutters but still wanted to collect water from their roof (see picture). They saw the RainSaucer as a cheaper more convenient gutter substitute. As you can see, their 8 daisy chained barrels fill simultaneously providing 440 gallons of storage. 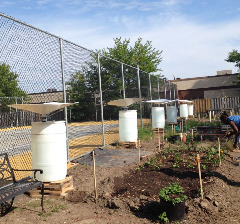 Community Garden in Toronto uses an array of RainSaucers to supplement the natural rainfall. 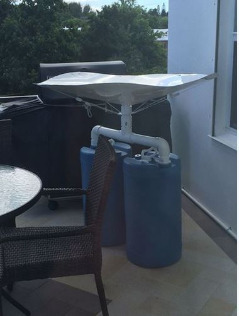 Customer in Bermuda uses a double barrel system on his balcony as a backup to his condo's water supply. All of Bermuda practices rainwater harvesting because there is no natural water source.